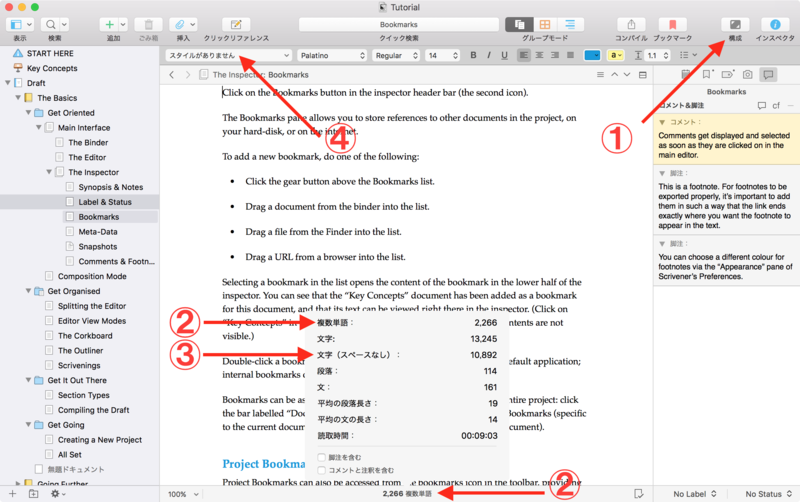 Please keep all feedback pertaining to the Japanese translation of Scrivener's UI to this thread. First, I checked Japanese translations in pull-down menu. Look the attached file please. I will continue to check. Thank you. I reviewed the main window of beta 13. Please see the XLSX and PNG together. Many thanks for all of this feedback! I have done my best to incorporate all of this into the next update. I think the fixed work is very good. That's great news, thanks for your help! I have added new comments in XLS as new colum "Reply from tester". Thanks, I have passed this onto the translator. From the translator. I did reply on email as well so sorry if this comes through twice. I reviewd "Scrivener_beta_13-fixed.xls", there is only one issue left. Please see the attatched XLS. Thanks! Hello Martin, I reviewd "Scrivener_beta_13-fixed.xls", there is only one issue left. Please see the attatched XLS. Thanks! I have informed the translator, I will report back shortly. The Japanese translator has asked is it just the yellow shaded cells? The only one issue is the blue shaded cell (see bottom right in XLS). New file attached from the translator. According to "Scrivener_beta_13-fixed2-Oct27 (2).xlsx", the issues that I reported in this XLS are all fixed. I will wait for the next beta. Thanks. I have now created an import file to correct the translations on the spreadsheets we have been working on. Can you have a quick check to make sure the English corresponds with the recommended translations you and the translator have agreed on. I had to piece it all back together into the format you see attached which wasn't an easy task. Many issues have been fixed by the XLS files that were exchanged in the past. I'm afraid, it seems that some issues have not been applied in this TXT. Please check this attached file. I added some comments after the characters "//". I did not add a line break or delete it. It will be better to use diff. Thanks. First of all, congratulations on releasing of version 3! A lot of Japanese users (and users in the future) are very very welcome to Japanese interface and vertical layout. I was surprised that iOS version was also translated into Japanese. Very thank you for your hard work! Now, I have got v3.0 for macOS, v1.1.4 for iOS, and v3.0 beta 1 for Windows. I discovered that translation work looks still in progress. Some issues which I had reported does not applied. May I still submit reports of translation here? Thank you. That's great, I will get the changes applied shortly. Thanks for all your help as well. I have removed the comments from the file you attached on here. Please can you have a final look over it before I send it to Keith for the next update. There is only one issue left below. As a precaution, I attach the file that I fixed. Thanks. "New Folder From Selection" = "選択項目から新しいフォルダを作成"
Thanks, I will get this sent over to Keith. May I report translation issues of iOS version 1.1.15 in this thread? All issues are in compile option settings. Current: "保存オプション" <--Japanese users will mis-understand that "open the options window to save file"
Suggestion: "Word" or "DOCX" <-- "Word" is the product name. No need to translate. System closed this discussion on 02 Feb, 2018 02:40 AM.